Grasslands are proud to represent the leading brands of Ride on mowers available in New Zealand. 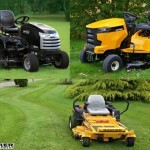 With so many models to choose from we can offer a mower that best suits your needs. Options include catching, mulching or side discharge and with a large range of engine options. All ride on mowers sold by our Grasslands stores in Kumeu & Ranui will be fully assembled with an extensive pre-delivery service performed. Delivery to your home (Auckland area) is included. We will demonstrate the operation and basic maintenance techniques. This is all included in your purchase price. After sales service is supported by our factory trained engineers. All riders have manufacture backed warranties so you can have total peace of mind. Grasslands will also provide a FREE service on your new rider mower after the initial hours of use (West & North West Auckland service area). Our knowledge & support will ensure you get maximum value out of your new rider mower, we promise it!